Molly Cliff Hilts' life and work can be described as a complex balancing act. 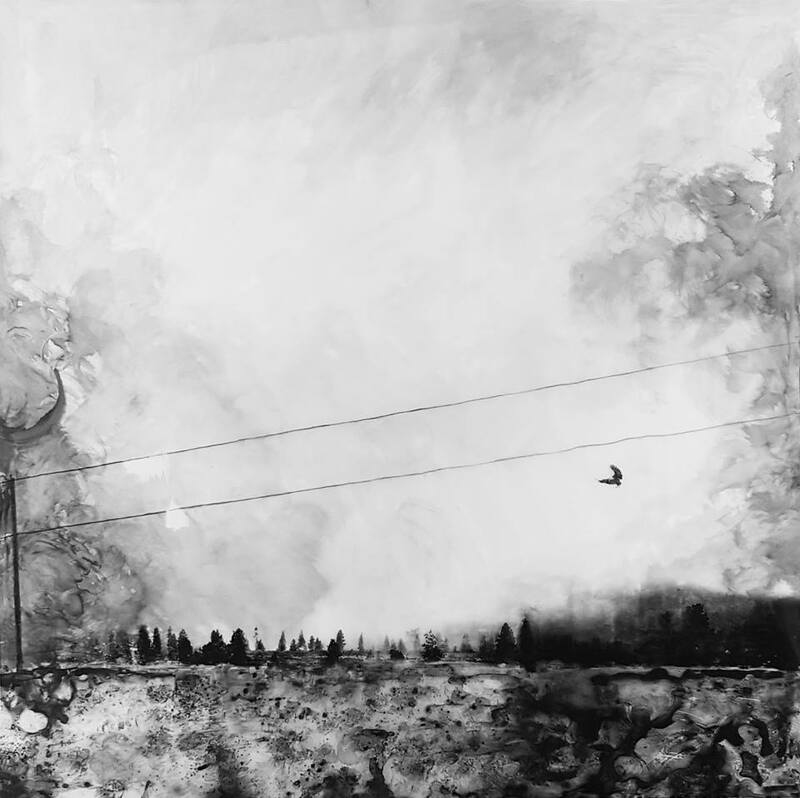 Ms. Hilts has the ability to apture a vast atmospheric landscape and pinpoint a detailed moment with encaustic, charcoal or photographic transfer prints in the same series. 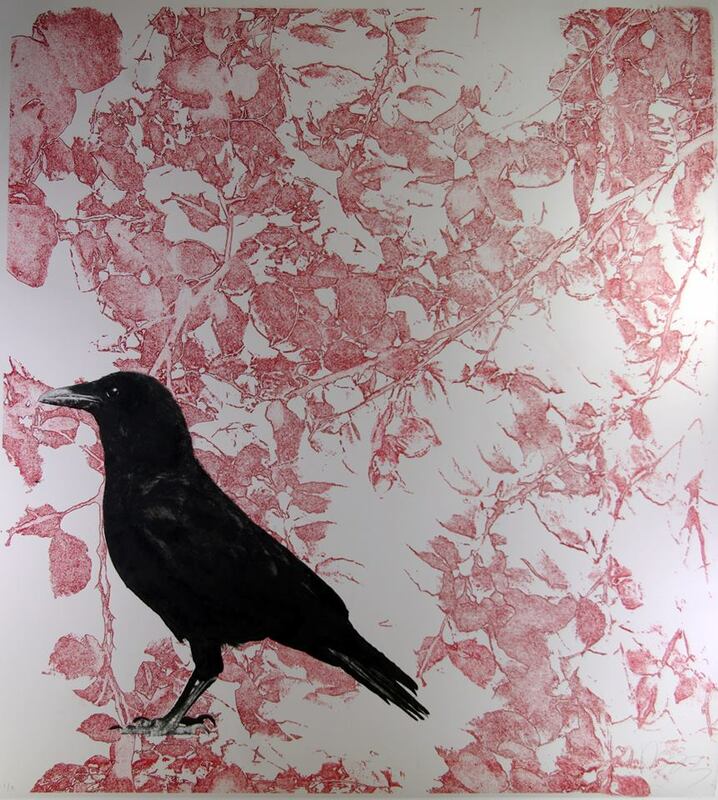 State of Wonder includes work from her encaustic landscapes and her enigmatic bird portraits. 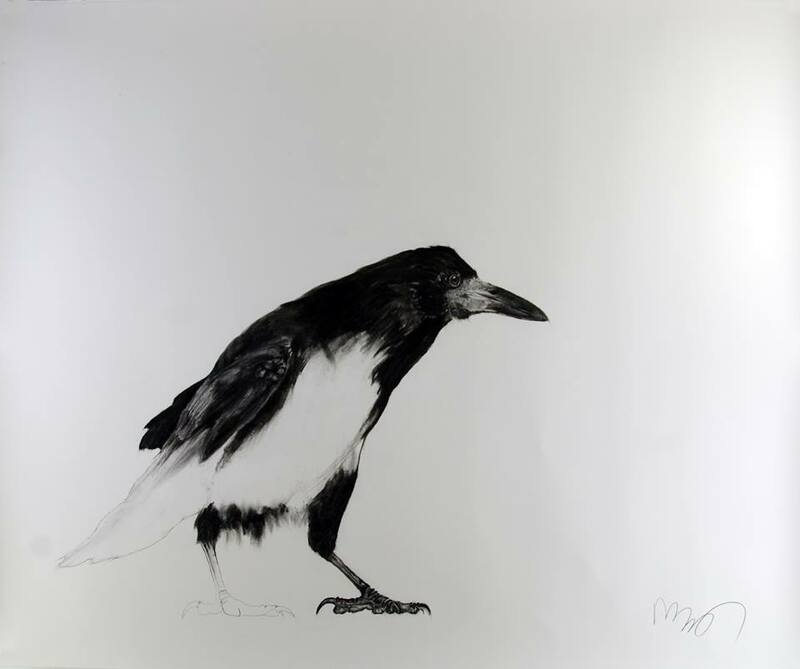 These stunning bird drawings executed against a backdrop of vintage wallpaper provide clues to Molly’s search for narrative. She thrives on family gatherings, and organizes artists’ workshops and symposia that promote others to share their stories. State of Wonder is sponsored by the UC Santa Cruz Arts Division, Porter College, and the Alumni Association. I would like to thank the following people for making this exhibition a success: Douglas Doyle Larson, Nancy Johnson, Molly Cliff Hilts and Dave Hilts. For more info on Molly's work see her website. from Douglas Larson: "To enter into Molly Cliff Hilts’s State of Wonder is to begin a journey of contemplation and reflection. Her large-scale landscape paintings often contain expansive horizons, with scenes of human interaction as distant points of interest and intrigue that draw in the viewer, speaking to the universal desire to connect to humanity. Molly teases out this yearning for human connection with simple vignettes—a person walking his dog along the surf; a temporary domain set up on the beach; a family on a road trip, their trailer just leaving the edge of the canvas. Even the landscapes that lack human figures evoke feelings of community and sociability, whether in the crows flying together into the open sky, leaving us humans behind, or in the placid community of cows, separated from us by a fence. And while living things often seem out of reach in Molly’s paintings, the vast open spaces—the superbly ethereal landscapes—pull inward, allowing the viewer to experience both a strong sense of belonging and, but of course, a meditative state of wonder. How, we contemplate, will our own story end?" 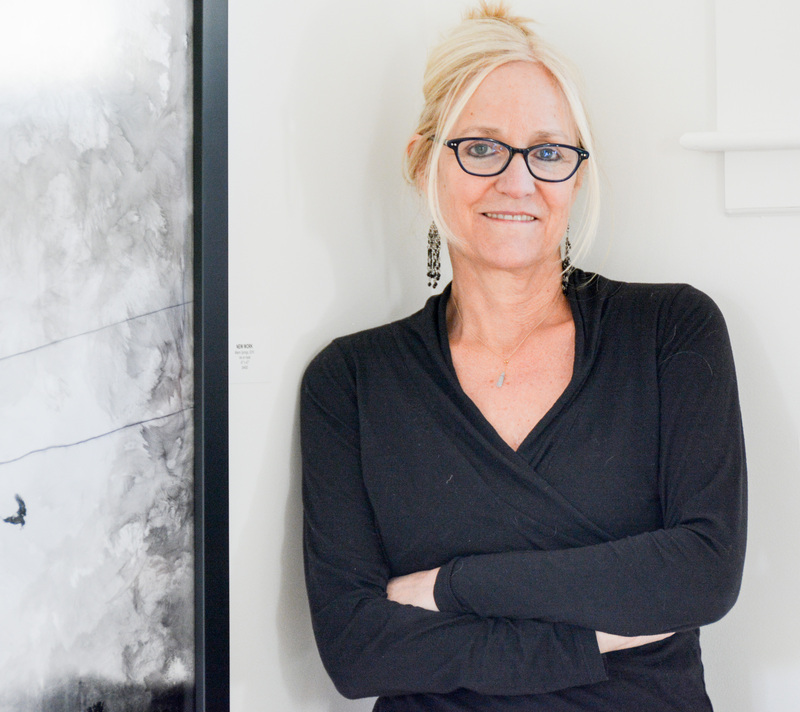 Molly is a UC Santa Cruz, Porter College Alumna with a BA in Studio Art (Porter ’81) and is currently on the education board at the Portland Art Museum. Molly is the great-granddaughter of Mary Porter Sesnon (1868-1930) and is like her in so many ways. discovery that she had started hosting salons before she realized her great-grandmother hosted very similar cultural salons one hundred years ago in Aptos, California. at the Sesnon House. 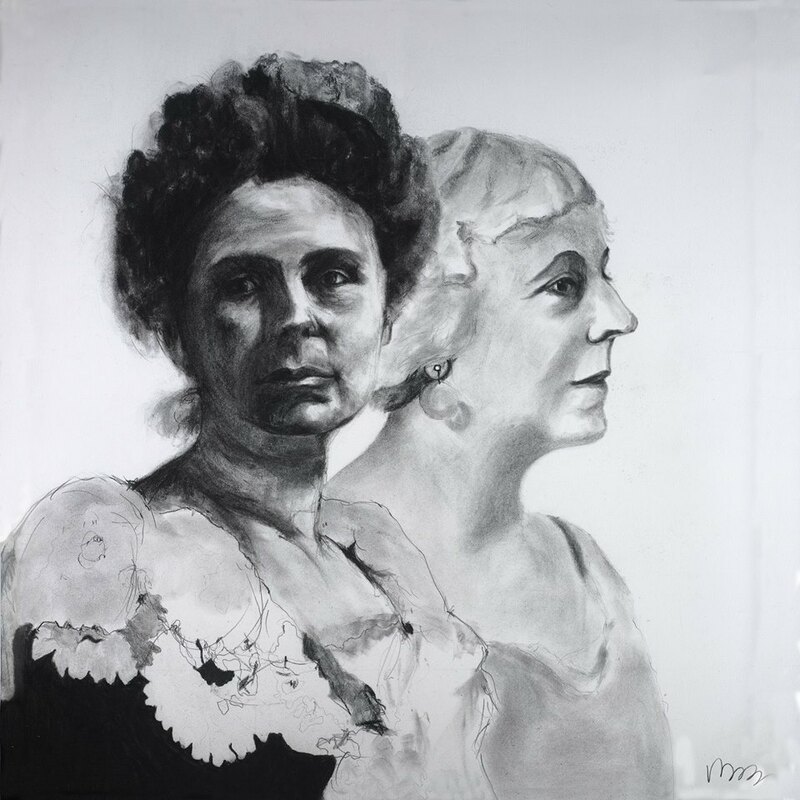 See concurrent History of Mary Porter Sesnon exhibition. In step with the Sesnon tradition, Molly Cliff Hilts and her husband, Dave Hilts, have been hosting salons at their home in Portland, Oregon, since 2000. These gatherings, which have evolved over the years to include musicians, poets, and writers, are the continuation of salons hosted by Molly’s great-grandparents, Mary Porter Sesnon and William T. Sesnon, at their summer home, Pino Alto on the Monterey Bay, beginning in 1911. The gatherings at Pino Alto included music, theater, and art, as well as dance performances that were occasionally choreographed by Mary on a stage in the ballroom. The salons would sometimes last for days and included many well-known artists of the period. Guests would partake of food and drink, and the grounds were often arranged for games and outdoor activities and were well documented by the local newspapers of the day. Notable participants included Herbert Hoover and artists Will Sparks, Ferdinand Burgdorff, Frank Unger, Haig Patigian, and Charles Dickmann. The salons hosted by Molly and Dave are equally lively, warm, and inclusive affairs that encourage interaction as well as reflection and exploration of artistic expression among friends and fellow artists and musicians, not unlike the more elaborate soirees of Molly’s great-grandparents a century before.